Hands up if you like lemon drizzle cake?! I do! Here is my lemon drizzle cake, perfect for easter as I have decorated with Easter eggs and little chicks! 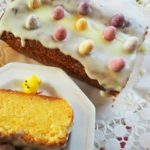 If you like this lemon drizzle recipe, then you may want to check out my Easter bunny cake recipe. 1. Pre-heat oven to 160ºC (140ºC fan). Grease and line a 900g loaf tin with baking paper. 2. In a large bowl, with an electric whisk, beat together the butter and sugar until light and fluffy. 3. Gradually beat in the eggs, with the finely grated zest of two lemons and the juice of ½ a lemon. 4. Fold the flour and ground almonds and the natural yoghurt into the mixture and then spoon into the loaf tin. 5. Bake for 40-50 mins until cake tester comes out clean. Leave to cool. 6. For the icing, use the other half of the lemon juice and mix with icing sugar and water to create a paste and drizzle over the cake! Gluten Free delicious lemon drizzle! Pre-heat oven to 160ºC (140ºC fan). Grease and line a 900g loaf tin with baking paper. In a large bowl, with an electric whisk, beat together the butter and sugar until light and fluffy. Gradually beat in the eggs, with the finely grated zest of two lemons and the juice of ½ a lemon. Fold the flour and ground almonds and the natural yoghurt into the mixture and then spoon into the loaf tin. Bake for 40-50 mins until cake tester comes out clean. Leave to cool. For the icing, use the other half of the lemon juice and mix with icing sugar and water to create a paste and drizzle over the cake! Looks sooo good! Happy Easter Christiana!